India, more popular as the land of snake charmers is the talk of the past. India extends far beyond this stereotype image. For centuries now, India has been placed as a cultural and historic tourist destination on the world map. But in the recent years, India has risen to be a prominent and distinguished destination for the adventure enthusiasts from across the globe. 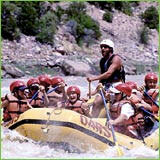 There exists a sheer variety of adventure sports in India that you will simply love to indulge in. The diverse opportunities for adventure offered by the only country on the planet Earth catapults several adventure lovers to this place each year. From rock climbing to trekking in the Himalayas to river rafting in Uttaranchal, from hot air ballooning in the plains of India to camel rides amidst the golden sands of the Thar Desert. If all this is offered by the North India, South India offers immense opportunities for indulging in water sports.